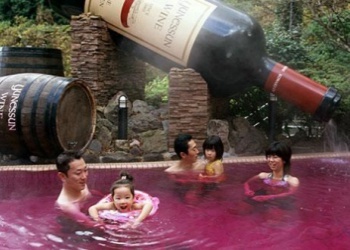 A unique spa containing real red wine. 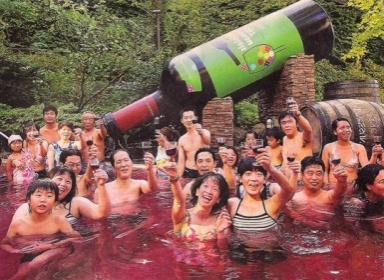 The huge wine bottle over 10 feet tall and is very remarkable. Bathing in wine is a rejuvenation treatment for the body, and it has been said that the Queen of Egypt, Cleopatra loved to bath in wine. 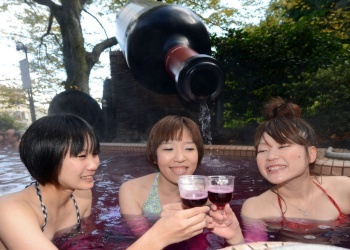 There are regular performances of pouring real wine into the spa a few times a day. The Yunessun is our largest spa resort zone where you can enjoy more than 25 different kinds spa related services and fun water recreational activities (see the complete list below). It is like being at the beach, so bring your swimsuits. The main Spa facility is called The God's Aegean Sea and will amaze you with its fantastic aqua surroundings. There is a Mediterranean theme for the amusement spas along with the Turkish Hamam and the Ancient Roman Baths. 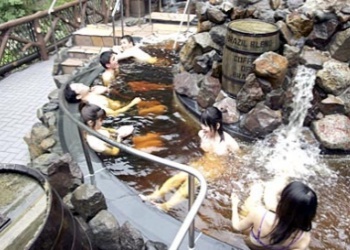 Combined with the relaxing Spa enjoyments at Yuneesun we also have a less relaxed, more wild side, come and see our dynamic water attractions including huge waterfalls and water slides. Take a ride down one of our slides. 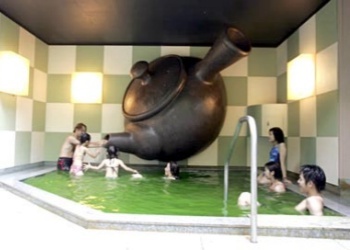 Fun for the whole family, both young families with their young children can enjoy being together.